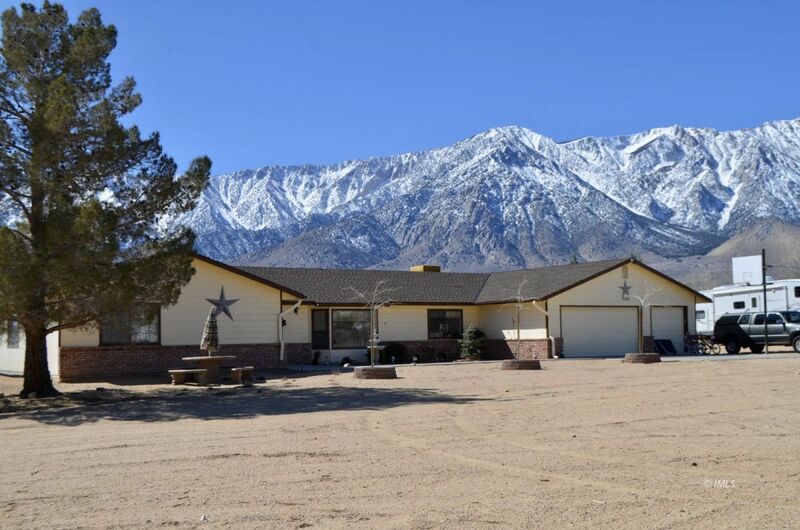 Amazing Alabama Hills Home with so much to offer! Everything you could ask for in the Alabama Hills! 4 bedrooms 3 baths plus a an attached 1 bedroom 1 bath guest unit or vacation rental w/separate entrance. Nice open floor plan. Kitchen has new cooktop, garden window and is open to the large informal dining area and roomy family room. There is also a formal living room and a formal dining room. Extras include skylights in the bathrooms and French doors off the family room leading to a large concrete patio. Master has walk-in closet and double sink bathroom with new custom shower. Large laundry room/pantry area with direct access to the 3 car garage. Central heating, money saving pellet stove and 2 evaporative coolers. Large 720 square foot barn and shop with slab, roll up door, natural light and additional enclosed stalls. Fully fenced 4 acres, complete RV hook-up and views of the Sierra. Horses are welcome. You're Gonna Love It!